There are several memory card types, so it can be a little confusing when you're looking to expand the storage capacity of your hot new MP3 Cell Phone. Musicphones, Camera Phones, and smartphones are a lot of fun, but they typically don't come with very much internal memory. Here is a brief overview of common formats used by cellular phones. Nearly all memory card types make use of solid state NAND flash technology. Unlike the hard drives you find in your computer, NAND flash memory has no moving parts. This is paramount for mobile devices (like cell phones), because they are prone to jarring which would otherwise cause read errors. The following memory card types are not cell phone specific; they are also used in digital cameras, PDAs, MP3 players, and several other portable devices. 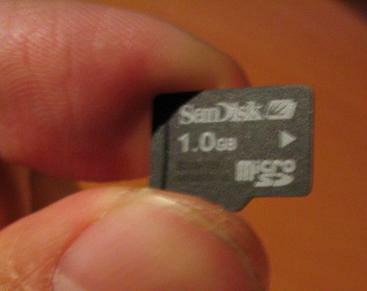 SD: The standard SD card is about the same size as a postage stamp, generally measuring 32 mm × 24 mm × 2.1 mm. There are high-speed versions as well, that are particularly well suited to high megapixel digital cameras (including those found on high-end cell phones, like Nokia N95). miniSD: These cards have about half the footprint of their standard-sized counterparts. Its potential, both in terms of speed and capacity, is notably lower as well. For more on miniSD, check out our main article on the format. microSD: Also known as TransFlash (TF) in the realm of cell phones, microSD cards are about fingernail-sized and are available in capacities of up to 2GB. It is currently one of, if not the most popular memory card expansion format for several cell phones, particularly those made by Motorola. SDIO: Standing for "Secure Digital Input-Output", these cards aren't typically used for memory expansion (though they may pull double duty in this regard), rather being implemented in PDAs and smartphones to add extra functionality (WiFi connectivity is the most common). Used only with Sony products, the Memory Stick range of media cards are commonly implemented in Sony CyberShot digital cameras, Sony Clie PDAs, and Sony Ericsson cell phones. Most of the formats are available as a "Pro" variant, offering significantly faster read and write speeds, as well as increased capacity. Memory Stick: Measuring about the same as a stick of chewing gum, this format is available in capacities as high as 8 gigabytes, but is typically too large for today's mobile phones. Memory Stick Duo: About half the size of a standard Memory Stick, the Memory Stick Pro Duo is very popular with Sony Ericsson Walkman phones, as well as the PlayStation Portable. Memory Stick Micro: The smallest of the bunch, this is an emerging format (sometimes referred to as M2) found in several of Sony Ericsson's latest handsets. While cards from the SD and Memory Stick families dominate the cell phone market these days, there are a few other formats that you may need to look into, depending on your chosen mobile phone. The most notable is the RS-MMC, or Reduced Size MultiMedia Card. Also available in a Dual Voltage variation (RS-DV-MMC), these postage stamp-sized cards are commonly found in a number of Nokia Cell Phones, like the N70 Symbian-powered smartphone. Some other memory card types you may come across include Compact Flash (CF, both I and II), MicroDrives, and MMCmicro Cards. These should not be confused with SIM (Subscriber Identity Module) cards found in GSM-based cell phones, as SIM cards are used to associate your phone with your cellular account (i.e., providing you with your phone number, address book, and so on).